PRINCIPAL says all students will gain from the merger. 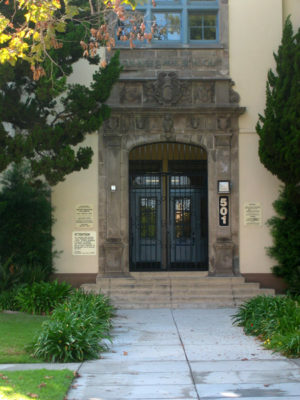 A merger of Van Ness Avenue School and its adjacent neighbor, the Frances Blend School on Clinton Ave., has been proposed by the Los Angeles Unified School District (LAUSD). Combining the two schools is a result of a LAUSD decree to increase graduation rates of students in special education. It promotes integrating students with special needs into general classrooms, said Katty Iriarte, Van Ness principal. “The name will be Larchmont Village Learning Complex, home of Van Ness Avenue and Frances Blend Schools,” said Iriarte. Blend educates children with learning disabilities from preschool through sixth grade. Its curriculum includes core subjects such as math, science, Braille or large print reading and writing, music and art. “Van Ness students will now have access to Blend’s visual arts, dance, music and theater instructors, and they also will gain empathy and appreciation of children with disabilities,” she added. She will be principal of both campuses. The school district’s goal is to reduce students in special education centers throughout the city over the next three years.